You know how sometimes the simplest tools are the most powerful? I see it all the time in my work with kids. A white board. A hand-written checklist. A picture taped to the corner of the desk. I certainly believe in (and frequently witness) the wonders of ‘high-tech’ solutions, but the simplest ones – often simple to design, make, and implement – seem easiest to overlook. Easy to overlook, especially at a busy time like back-to-school – our minds spinning with possibilities, fresh from the summer break. It’s at this time of year that I may be mostlikely to think big, complex, and high-tech. Maybe that’s why, at a Back To School AT/AAC Prep session, put on by the PSU Universal Design Lab and Dr. Samuel Sennott, the SETT framework caught my attention. 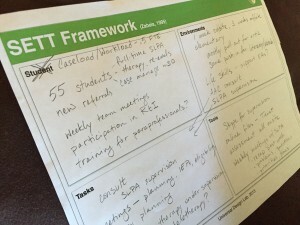 SETT is an acronym for Student, Environment, Tasks, and Tools, and is used to describe a 4-part model for collaborative decision making in all phases of assistive technology service design and delivery. This framework supports teams in making plans, identifying resources, and setting priorities and is frequently used in the process of choosing an AT/AAC device or approach. Most recently in my personal experiece with SETT, I was a part of a team choosing an AAC approach for a non-verbal kindergartener last winter. This student is still on my caseload, and it struck me this fall that the first grade is a different environment from her kindergarten classroom, with potentially different tasks demanded of her. Though the device we chose last winter may still be appropriate, a team meeting, I thought, could help us make sure we were still using the most well-suited tools. Some sort of SETT epiphany! It was like I had been working in a dark room with a spotlight on that one student… and someone turned the lights on. At that moment, I saw lots of other ways I could harness this simple and powerful framework, choosing the right tool for whatever job was at hand: * my teletherapy work, * our company’s efforts to create community, * a colleague managing an unexpected workload. The SETT framework is designed to walk a team with lots of different perspectives consider all the available information before coming to any decisions. This is essential in a process of problem-solving, especially when problems are complex. Whether trying to manage workload for yourself or come up with a new therapy idea after your first 5 haven’t worked, it is only with a full picture of the demands, environments, and expectations that make up the issue, that you can really address the barriers – real or assumed – to finding a creative, efficient, and workable solution. My challenge to myself this fall, and to any of you facing complex problems involving multiple players, is to approach these big issues from a SETT perspective. To sit down in front of a blank matrix, and use the SETT framework to create (in the words of creator Joy Zabala in this article) an atmosphere of “active, nonjudgmental sharing”. It would be great to have a collaborative team, but even if you’re asking a co-worker or colleague to help you think about your personal workload, start by sharing – actively and nonjudgmentally! – all the information you have. * Do you have a complete picture of the issue? * Are there ‘unknowns’ you still need to research? * Who are the parties that will be affected by your solution, and what are their priorities? Then, just as the SETT moves us forward, consider the barriers that are keeping these needs from being met, and the inevitably wide variety of tools available to address those needs. Just see if the nonjudgemental and open framework of a blank (and maybe slightly modified to meet your needs?) SETT matrix can help you or your team to approach complex issues in a creative way. It might just be the simple, powerful, but overlooked tool, right in front of us. A new lens, through which we can examine our toughest challenges.